A midsize luxury sedan has to hit all the right notes. Confident stance, premium power, and high-value features are a must. Those seeking all this and more at an affordable price-point may be interested in a used Acura TL in Carrollton TX. The current inventory of Acura TL models at Certified Autoplex offers multiple features. Leather upholstery, a sunroof, heated and cooled seats, a rearview camera and navigation are just a few of the comfort, convenience and style features available on these models. All current pre-owned Acura TL inventory comes with a powerful V6 engine, an automatic transmission, and front-wheel drive. Even better, currently available models also come with a Lifetime Powertrain Warranty. That means that our customers don't need to worry about a decrease in quality just because they are exploring used options. Our Acura TL inventory is constantly shifting. Explore your current options online today, and schedule a test drive if you find a vehicle you like. If you don't see what you like, be sure to keep an eye out for fresh, high-quality pre-owned models arriving every day here at Certified Autoplex. Each used Acura TL in Carrollton TX doesn't just live out the high standards of the Acura luxury brand, but it has also been examined by our team of experts to make sure that it meets our quality standards as well. Each pre-owned luxury vehicle available on the lot here at Certified Autoplex delivers top value because we believe that our customers deserve only the best. Our current TL models are from the 2013 and 2014 model years and the fourth-generation TL model midsize sedan. 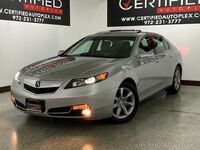 For luxury shoppers looking for the predecessor of the Acura TXL, the pre-owned Acura TL models available at Certified Autoplex can offer an option that delivers top luxury and midsize practicality. Schedule your test drive today to reserve your ideal used Acura TL at Certified Autoplex. You can fill out the form on this page or contact a member of our sales team. Interested in a Used Acura TL?